At Fix My Touch in Kelowna, we strive to stay on trend and up-to-date on the latest cell phone news and smartphone technology, and provide our clients with the best cell phone repair and phone repair warranty. As your top Cell Phone Repair Kelowna provider, we specialize in iPhone, Samsung, Blackberry, Motorola, LG phone repair and more. When a client walks in and asks, “can you fix my cell phone?” One of the most common issues we hear and a top service we provide is phone water damage repair. If you require a cell phone repair due to water damage or require a cell phone fix for any reason, it’s important to have it fixed ASAP. Still not convinced? 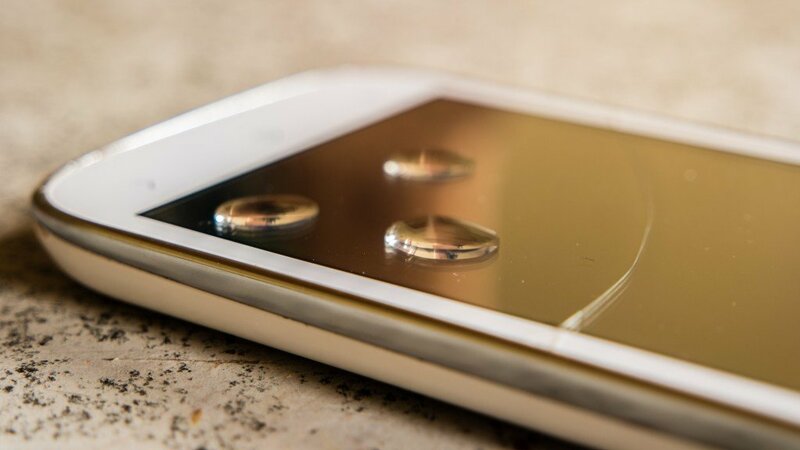 Read more about the importance of phone water damage repair from our team of experts at Fix My Touch. If you suspect your phone has water damage, and requires phone water damage repair, there is the chance that modular parts will require replacing. Parts including batteries, screens, and speakers may be part of what is required when we’re accessing your cell phone fix. If this is the case, we will notify you before any additional expenses are incurred. If possible, it’s important to remove your battery from your phone. Secondly, do not continue to use your phone once it has been exposed to water. This means contacting us from a different phone, or emailing us from a different device. The sooner your phone is treated and brought in for phone water damage repair, the better the chance are that the phone will have a full recovery. We offer free estimates! Every device reacts differently to water damage, and may require a slightly different treatment during the phone water damage repair process. There’s no way for us to know what is required to repair your phone without seeing it in the shop. A phone water damage repair is $65.00 for corrosion removal and diagnostics. Cell phone repair, especially something as sensitive as is phone water damage repair, is like all other good or service that you purchase. Investing in a reputable company is essential if you want a quality cell phone repair job. For a majority of smartphone users, our phones are our main form of communication and is often where we store a lot of critical and personal data. It’s important to have your phone repaired by a Kelowna cell repair company that you trust. Clients commonly ask if a third-party repair will void their manufacturer’s warranty? In actuality, any physical damage to your smartphone automatically voids your manufacturer’s warranty, which means your warranty is void before you even arrive at our Kelowna cell phone repair store. We’ve witnessed physical damage, even damage unrelated to the initial cell phone repair problem. An experienced and professional cell phone repair company will ensure you get your cell phone back as quickly as possible. At Fix My Touch, we have the expertise to get the job done well and efficiently. Once you’ve brought your phone into Fix My Touch, we can access the and provide you with an estimate for the phone water damage repair. Has your phone recently been damaged? For further details about our phone water damage repair, please don’t hesitate to contact Fix My Touch in Kelowna at 250-300-8551 for further information.